There has been some talk about Globalfoundries’ decision to not chase after the leading edge 7nm node. As many in the industry obsess over the leading-edge node (guilty as charged), Globalfoundries decided not to continue down the leading edge FinFET path and instead go after a diversified foundry approach. I believe this new approach that Globalfoundries is going after is focused on executing in places that make sense to Globalfoundries current and future customers’ needs. Simply put, the cost-benefit analysis the company’s leadership made effectively didn’t see much of an upside for the company. Furthermore, because Globalfoundries is a private company they can decide to do what’s in the long-term best interest for the company without worrying about what leading-edge fans think. 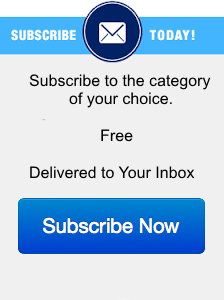 This allowed the company to make its major pivot towards a diversified approach that helps the company fill specific customer needs both in the present and future. These four areas are where Globalfoundries will continue to invest so that their customers are getting the results that they expect from a foundry that is focusing on them. 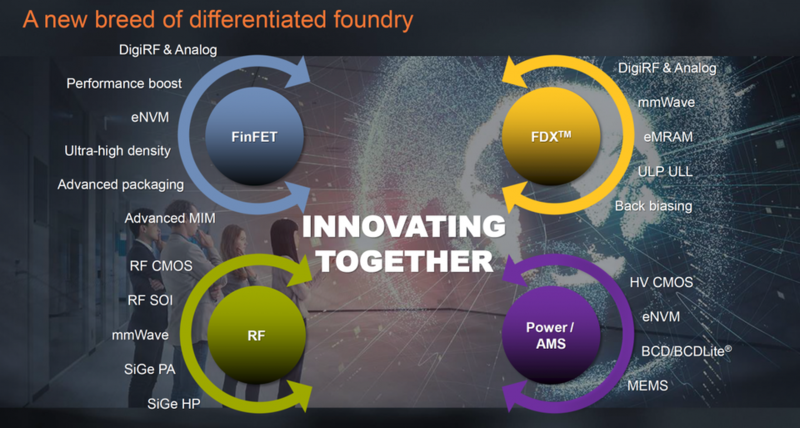 Globalfoundries wants their customers to think of them first when they think about RF because they offer so many different solutions including RF SOI, SiGe HP, SiGe PA, RF CMOS, RF FinFET and RF FDX. This diversity of processes are what allow Globalfoundries to serve some of the biggest names in RF like Qualcomm, Skyworks, and Qorvo. 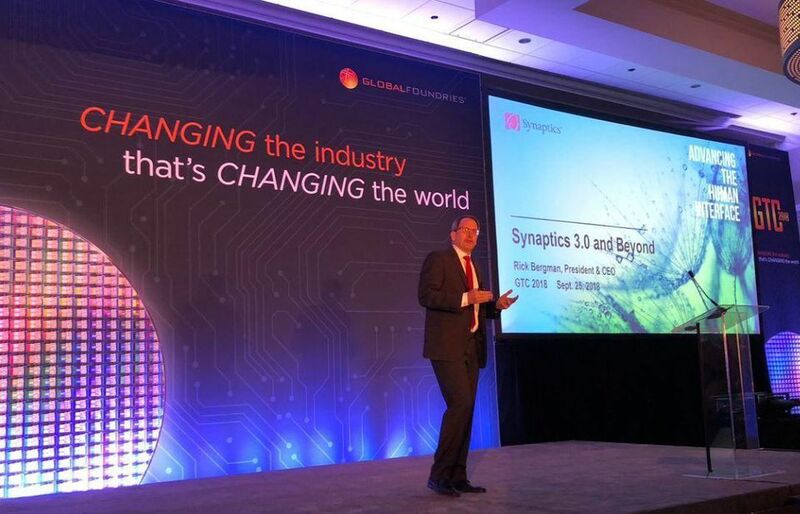 Globalfoundries is also taking on new customers like Synaptics, a company that has also recently pivoted towards IoT with “Synaptics 3.0” and are working closely together to enable one another’s future success in its pivots. Globalfoundries announced that they are now delivering RF SOI client chips using their 8SW process on their 300mm platform for mobile RF solutions. During the show, the company pronounced their leadership in RF-SOI claiming to have #1 market share (GF estimates) in the space and announcing a milestone of more than 40 billion chips shipped which is a staggering number when you think about it. This 8SW process in 300mm manufacturing is specifically designed to allow Globalfoundries’ customers to address more frequency bands including high-band LTE and Sub-6GHz 5G. The 8SW process is produced on Globalfoundries 300mm production line at Fab 10 in East Fishkill, NY and helps to deliver significant improvements to performance as well as 70 percent reductions in power and 20 percent overall smaller die sizes. Globalfoundries has also expanded its RF ecosystem from only 7 companies in the beginning of this year when it was announced to 14 companies today. Globalfoundries is killing it in this space. At the show, the company announced updates to its 14/12 nm FinFET offering that are designed to deliver better scalability and performance, with a special focus on data centers and autonomous vehicles. With the growth of companies like AMD, which is one of Globalfoundries biggest customers today, there is a reason to introduce updates to Globalfoundries FinFET process. However, as AMD continues down their path of following leading process nodes, its expected that they will no longer utilize Globalfoundries for their leading products as they go into 7nm and beyond. However, Globalfoundries appears prepared for this with a renewed focus on automotive technologies and enabling automotive vendors to manufacture high performance and efficient automotive chips. While the distancing of AMD from Globalfoundries may be a bit saddening for those that know the company’s roots, it may be more of a sign of Globalfoundries maturity than anything. Globalfoundries 22FDX process is also coming along nicely in the Dresden fab, including its newly announced partnership with Imagination Technologies to provide ultra-low-power baseband and RF solutions for BLE. The company also announced that they are moving along nicely with design wins, with over 55 different design wins for 22FDX and over $2 billion in design win revenue. Globalfoundries has grown their FDXcelerator ecosystem partnership program from only 7 companies in 2016 to 52 companies in 2018. Many of Globalfoundries available processes are designed to address the needs of high-growth markets like IoT, 5G and automotive. They are designed to be cost and power-aware on the IoT side with the 22FDX and 12FDX products while they are also designed to be power and performance-aware on the various RF products that the company offers. 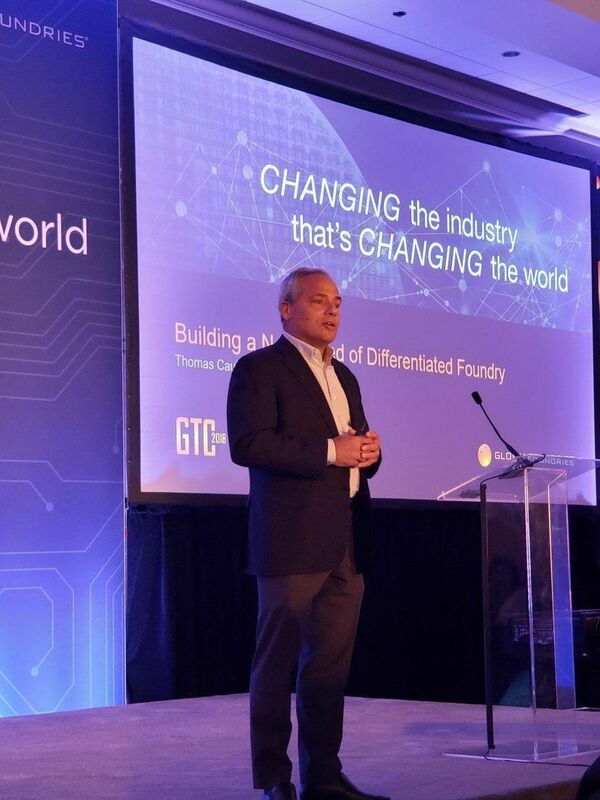 Globalfoundries is also seeking to further differentiate the company’s offering by offering new advanced packaging technologies, like 2.5D and 3D, to enable auto, networking, and machine learning applications that wouldn’t be cost effective any other way. Overall, I believe that Globalfoundries has done a very good job of addressing doubts about the company’s future due to the company’s pivot and have proven that they made this decision with only the future and their customers in mind. I also believe that Globalfoundries made a pretty good case for their role as a differentiated fab partner to their customers in many different verticals and how they will be a key partner for many of their customers in making 5G, IoT and automotive growth possible. Globalfoundries investments in RF-SOI and other RF technologies are already showing dividends for the company and I believe as more devices add connectivity their role and capacity will only increase. Note: This blog contains significant contributions from Anshel Sag, Moor Insights & Strategy analyst, who attended the GTC Conference.